I love cheese... I have to be honest here, I really do. Not all cheese's, but there are certain kinds that I just adore. Cheddar, Mozzarella, Parmesan, Swiss, Pepper Jack, just to name a few! But I've never considered myself much of a cheese snob until I met my Hubby. I will never ever forget the first Christmas I spent with my In Law family, not only was it my first time meeting them, so there was that awkward factor, but it was my first time spending Christmas away from my family. I remember that Christmas Eve so well... We spent the day just relaxing with his family, getting to know each other, and then going to the church's Christmas Eve service that night. Which was incredibly nerve wracking for me, meeting the congregation, and extended family... Let's just say before the service I was so nervous I felt sick. Everything went fine, at least for the most part. But afterward when we finally headed back to my In Laws I was finally famished! I hadn't eaten in hours because of my stomach and was ready for some serious grub. But to my surprise I find out his family has no real intentions of eating dinner, because they all ate such a big lunch. So when they pulled out different cheeses and crackers for everyone to munch on, I was floored. lol! This was the first time I experienced the art of eating cheese and crackers as a real "meal" and the tastes to look for in different cheese's. Plate of Cheese's and pairings. The Sargento is the "marbled" looking one! As some of you know I'm a part of the FoodBuzz Tastemaker Program, which is totally awesome! As a part of this program I received a $25 American Express Gift card to try my choice of Sargento's Natural Cheese, a processed cheese of my choice and the pairings of my choice (crackers, fruit, etc.). I have to admit there wasn't a huge selection at our store of Sargento's cheese, but after a while of hemming and hawing I decided to try one of their blends, so we got the Cheddar Mozzarella Blend... Oh my word y'all! I've never had a blended cheese quite like this before it was delicious!! 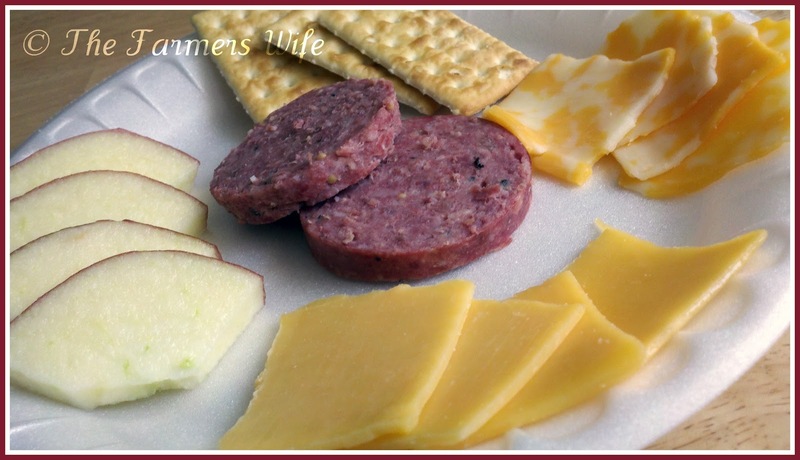 I got a pairing of Summer Sausage, Apples and my favorite Crackers to go along with this tasting, (and of course the processed cheese). There was a pretty large difference between the Sargento and the Processed Cheese. The taste of Sargento, especially when paired up was exceptional. The processed was well... Processed. Not great but not completely awful either. They have a very different texture and taste from each other, and I have to say the Sargento was strong on both the Cheddar and Mozzarella in this blend, a great mixture of salty and almost fruity tastes. I would highly recommend giving the Sargento Cheese's a try, especially the blends... They really are delicious, however they do melt REALLY easy... So don't eat them in a room that is over 80 degrees, we found out (we live in AZ folks, it gets hot here!) or it starts to get gooey really fast. However this is GREAT for the recipe I am about to share with y'all! Today my Little Sous Chef and I are stuck home in some nasty weather, so we decided to have some fun with lunch. We took a few simple things we had on hand, rolls, ham, cheese, honey mustard sauce and apples and made ourselves some sandwiches. I was a bit skeptical of his idea, but it did smell awfully good... Who knew he would hit it out of the park with this?!? I have to say I just loved this, and the cheese brings everything together because it's subtle enough to let the other flavors shine, but you can still pick it out of the line up! Preheat your oven to 350F degrees. Using a serrated knife, slowly slice through the rolls lengthwise (place the rolls on a flat surface, and holding the top in place slice through the entire "tray" of rolls so they are like one long flat surface). In a small bowl combine the mayo, mustard and honey with whisk until smooth. Then spread about 1 teaspoon of sauce over the top and bottom halves of the rolls. 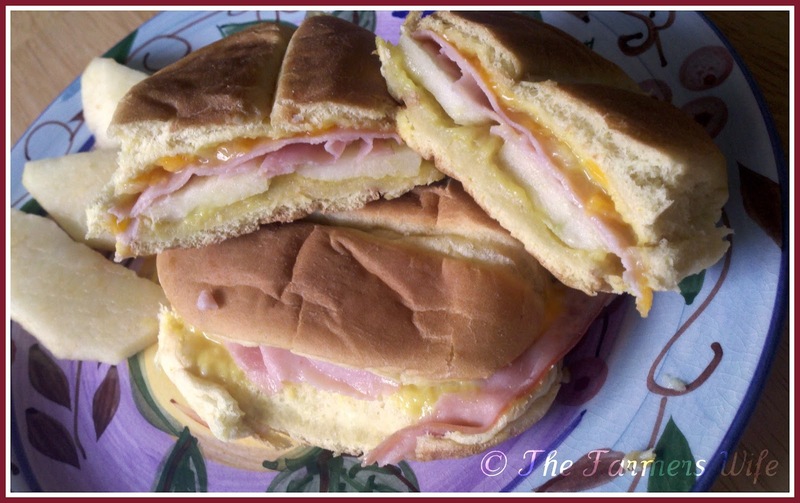 Place 2 slices of apple on the bottom half of each roll, then top with the ham and cheese. Place the top half back on, and wrap the entire thing in foil. Bake for 15 minutes or until cheese is melted and everything is warmed through. Serve warm. I have to say not only did I love the cheese by itself, but in this little sandwich is was amazing! These were so easy, and would be exceptional for parties! 5 stars. Great sandwiches! Being a tastemaker is fun!! I am posting my cheese one tomorrow! What a great tradition. My husband would adore it. Totally drooling over this sandwich. The flavors sound so appealing. I've had cheese and crackers for lunch a few times... good food. Your sandwich looks great. All those brown baggers that bring their lunch will be pretty envious if they saw this sandwich! Between the potato bread is a mouth watering stack of goodness. Great post! yum! I agree, cheese is the BEST! Ooh! I forgot how much I miss summer sausage! We had tons of varieties in WI, I think I liked Usinger's garlic beef the best, but down here in TN about the only thing you see is Hillshire Farms. Cak!